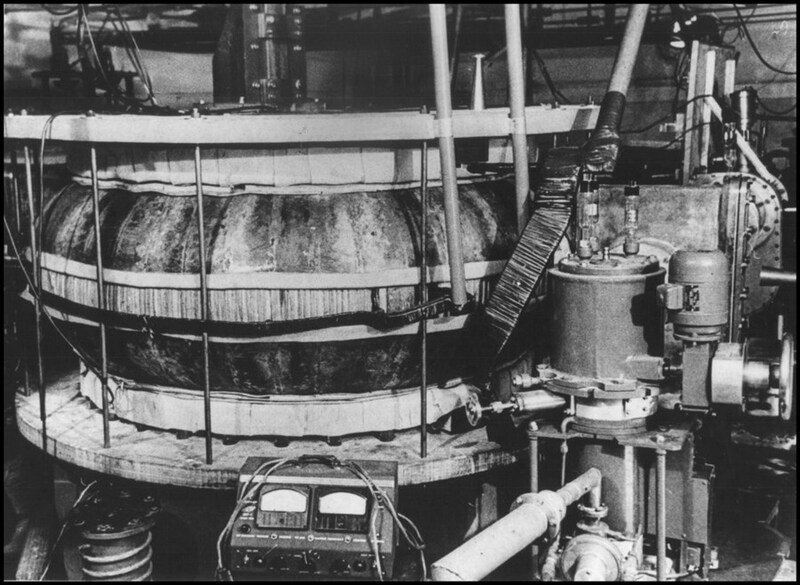 The world's first tokamak device: the Russian T1 Tokamak at the Kurchatov Institute in Moscow. Plasmas in the range of 0.4 cubic metres were produced in its copper vacuum vessel. Following the first fusion experiments in the 1930s, fusion physics laboratories were established in nearly every industrialized nation. By the mid-1950s "fusion machines" were operating in the Soviet Union, the United Kingdom, the United States, France, Germany and Japan. Through experiments on these machines, scientists' understanding of the fusion process was gradually refined. ITER: writing the first chapter of 21st century fusion. Producing fusion energy, it soon became clear, would require marshalling the creative forces, technological skills, and financial resources of the international community. The Joint European Torus (JET) in the UK, in operation since 1983, was a first step in this direction. JET, which is collectively used by more than 40 European laboratories, achieved the world's first controlled release of fusion power in 1991. Steady progress has been made since in fusion devices around the world. The Tore Supra tokamak in France holds the record for the longest plasma duration time of any tokamak: 6 minutes and 30 seconds. The Japanese JT-60 achieved the highest value of fusion triple product—density, temperature, confinement time—of any device to date. US fusion installations have reached temperatures of several hundred million degrees Celsius.